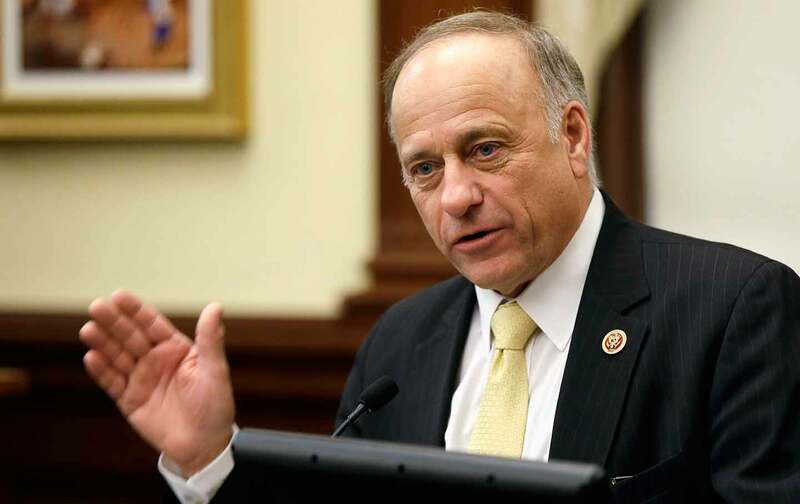 In lending his support to Geert Wilders, Congressman Steve King has crossed a dangerous line. Donald Trump has made no secret over the years of his regard for Iowa Congressman Steve King, and of his determination to embrace most if not all of the incendiary Republican representative’s crude “know-nothing” politics of Muslim bashing and immigrant blaming. In the fall of 2014, when he was still just considering a presidential run, Trump traveled to Iowa to headline a private fundraising event for King. Now Trump is a crude “know-nothing” president who engages in Muslim bashing and immigrant blaming. And King is tweeting about his enthusiasm for Geert Wilders, the Dutch extremist who is the darling of white nationalists in Europe and the United States. Republicans in Washington need to join Democrats and King’s own state party chair in formally condemning the congressman. Trump, as the president and the leading figure in the Republican Party as it has now reconfigured itself, has a distinct moral and political duty to make the break with the Iowan with whom he aligned himself back in 2014. But Trump also has a tendency to resist pressure to abandon wrongheaded associates and appointees. No matter how the president reacts to King’s latest outburst, however, congressional Republicans can and should send a clear signal that they reject their colleague’s crude bigotry. House Republicans, led by Speaker Paul Ryan, need to censure King. King has surely discredited himself, and as a sitting congressman he has discredited—and diminished—the US House of Representatives. He merits, at the very least, the response from his colleagues that Democratic and Republican US senators directed toward Wisconsin Senator Joe McCarthy when they finally held the disreputable hatemonger to account in 1954. The bipartisan 67-22 Senate vote to censure McCarthy for abusing his position did not remove him from the Senate but it marked the right-wing Republican as a man who had shamed himself and the chamber. And that vote did much to break the spell of McCarthyism that had so damaged the country since the senator began making unsubstantiated charges against diplomats and soldiers and others as part of his “Red Scare” rampage. McCarthy was a Republican, serving in a Republican-led chamber. But congressional Republicans of sixty years ago had the courage to place conscience above partisanship. The question is whether Paul Ryan’s Republicans can muster the same combination of courage and conscience that their historic predecessors.